Last week a momentous decision was made — it was time to run down my stash of desiccated coconut. My stash of desiccated coconut was first mentioned over a year ago, and despite my best efforts, it’s probably increased since then. Last week I made Coconut Pullapart Rolls from Not Quite Nigella. They turned out really well, and next time I’ll add some lime zest to the coconut filling. Today I consulted my Women’s Weekly recipe cards and came up with this delightful cake. Toast all the coconut in a frypan over low heat, being careful not to burn. Set aside two tablespoons for the icing. Cream butter and sugar together until light and fluffy. Beat in golden syrup. Add in eggs one at a time, beating the first in thoroughly before adding the second. Mix in the coconut, vanilla and salt. Add in the sifted flour gradually, alternating with the milk. Mix well. Bake for 35-40 minutes. When cool, ice with lemon icing, sprinkling the rest of the toasted coconut on top. For the icing, simply sift the icing sugar and add the lemon juice. Mix until it’s at a soft spreading consistency. This cake is fantastic. The toasted coconut reminds me of the marshmallows from Darrel Lea, and the combination of brown sugar and golden syrup gives it a faintly caramel flavour. Although I followed the recipe this time round, it would work just as well (or better) with the fluffy lemon icing used on the ginger cake I made last year. It’s a pretty moist cake which surprised me. I imagined that the crumb would be drier, but the all-knowing toothpick came out clean so it was done based on that test. That said, it wouldn’t have hurt to bake it a little longer. i totally need a pantry app. I’m relying on Matt. His knitting app is my favourite. I reckon any pantry efforts he could make would be just as valuable! I always have too much dessicated coconut and too much brown sugar. I have to say that cake looks and sounds lovely! 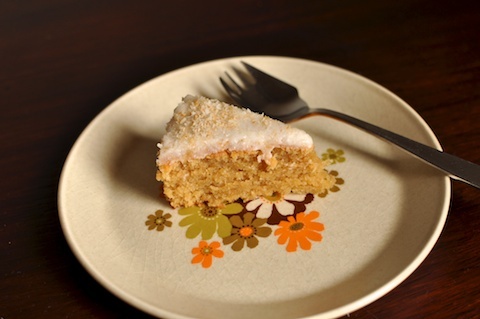 I love a moist coconutty cake. Thanks for sharing the recipe! That cake looks very delicious! hmmmm coconut. i love that you served a womens weekly recipe on that gorgeous plate too!